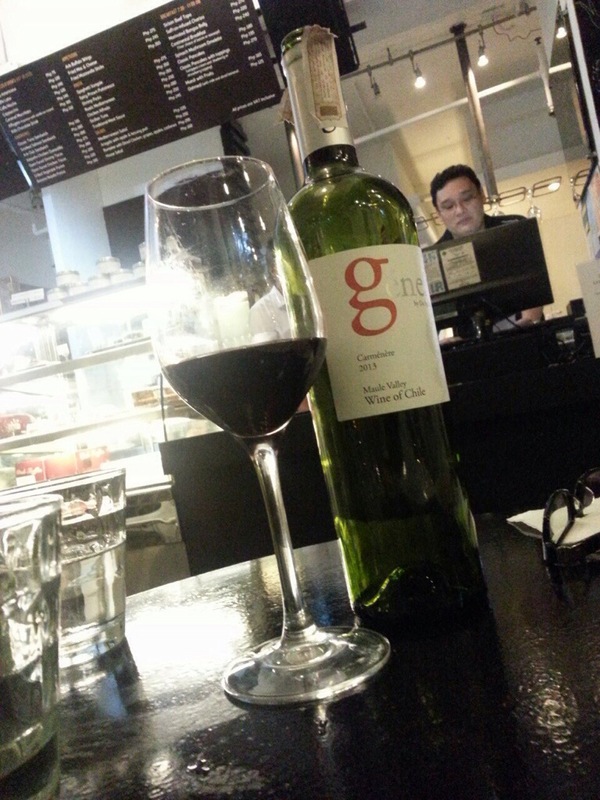 I started this blog with the excitement of seeing great things for the Manila wine scene. What with affordable flights and easy access to information (DSL/phone network speeds/expensive services nonwithstanding), people have come to realize a wine breakthrough: Red wines are not just Cabernet Sauvignons. Or Merlots. It has been a great delight of mine to find out that establishments have begun carrying this wonderful red wine called a Carmenere. For those who are not in the know (or stuck with some lame service provider and couldn’t immediately google the information), let me give you a bit of background. Carmenere is now flourishing in Chile, but it did not originate there. It actually came from France. With the onslaught of the phylloxera bug, however, it disappeared… Not after some of the vines got planted in Chile. It is important to note as well that for the longest time, Chileans thought they were planting Merlot. After scientists analyzed the grapes, they have discovered the long lost Carmenere. It’s beautiful to see vineyards with Carmenere. Its leaves are yellow/red/orange year round, giving you the impression of a perpetual autumn. In fact, speaking of having the ability to travel easier, let me give you a tip: If you’re ever in Chile, do not miss the chance to visit the fabled vineyards of CASILLERO DEL DIABLO (cellar of the devil) by Concha Y Toro. Legend has it that back in the late 1800s, Don Melchor (the owner of the Concha Y Toro vineyards) faced an issue of losing many of his fabulous Carmenere bottles in his cellar from theft. To address that, he decided to start a rumor that there were devils lurking in his cellar. To further substantiate these rumors, he would make banging noises, thus giving rise to the name. 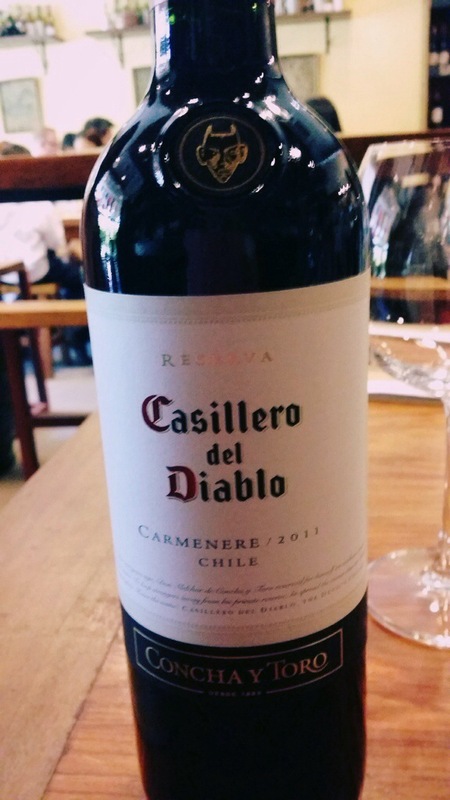 Casillero del Diablo is the ultimate benchmark for what a Carmenere is supposed to taste like: a beautiful symphony of dark chocolate undertones, tobacco, and oak with a rich body coyly hiding under a silky texture. That description being said, this is a versatile wine: It goes well with chocolate desserts and rich red meats. Google Carmenere and you will immediately find Concha Y Toro. What’s wonderful about this wine group is that they offer wines for every budget without compromising quality. From the very affordable line called Frontera to the ultimate Carmenere called Carmin de Peumo, there is a Carmenere for everyone. There is also the Philippine staple, Montes Alpha. For ages I’ve been frustrated with friends purchasing nothing but their Cabernet Sauvignon… Not to say that it’s bad (it’s actually pretty decent), but do try their Carmenere as well. We also discovered something in the newly (re)opened Ark along HV de la Costa. One super “sabaw” night, Gerry (this blog’s resident artist) and I decided to discuss editing some graphics for 2shots. For some reason, however, we were both too zonked out with the week that we ended up hitting Ark instead for some grub. I was pleasantly surprised to find out that their house pour is, you guessed it: a Carmenere. I had a wonderful talk with the owner, Ron, and proceeded to discuss (or lose him as a friend forever, hehehe) Carmeneres with him. I also discovered an equally affordable but interesting Carmenere blend: the Lapostolle. Fans of Moët et Chandon would be delighted with their Chilean creation. It maintains a certain elegance that is ever present with French wines, but applied to the beautiful terroir and grapes of Chile. Their take on the Carmenere is simple yet full of character. Do try their Merlot, which is blended with 25% Carmenere. It will make you think of a symphony of blackberries and chocolates. I keep talking about dark chocolates and Carmenere. What’s interesting is whether very subtly or very profoundly, I find Carmeneres to always have that element of dark chocolate in them. Speaking of which, now I’m craving for chocolates. Please share your Carmenere adventures with me. Cheers!